Sound (8.7/10) – The T-Peos H-100 is part of the still-rare breed of reasonably-priced hybrid earphones. I’ve reviewed and/or auditioned a few others in this price range – the old UE Super.Fi 5EB, the Scosche IEM856MD, and the Audiofly AF78. None of those were particularly impressive so the T-Peos H-100, with its bright, crisp sound and added sub-bass kick, sort of defaults to being the best of the bunch. The sound of the H-100 is rather unique, with the overall tone on the cool and bright side but plenty of deep bass kick afforded by the dynamic driver. Bass depth and presence are quite impressive, but not excessive – the sub-bass extends well and affords the bright sound some footing. There is little mid-bass boost, however, and almost no mid-bass bloat. This makes the deep bass seem more prominent and also prevents veiling of the midrange. The midrange and treble seem to be handled by the armature of the H-100, with the signature being v-shaped overall. The mids, especially the lower mids, appear a little thin and withdrawn, reminding me of JVC’s FX40 model. 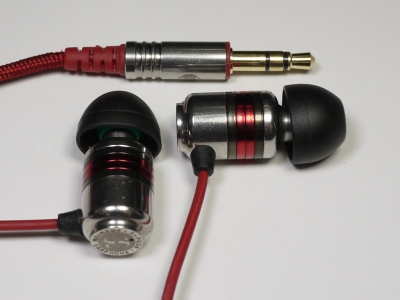 Many BA-based earphones, such as the VSonic VC1000, MEElectronics A161P, and Ultimate Ears 600 – not to mention dynamic-driver competitors – have more filled-in and prominent mids compared to the thinner-sounding H-100. The treble of the H-100 is bright but not overbearing at reasonable volume levels. It sounds clean and crisp and boasts plenty of energy and sparkle, yet isn’t as harsh as may be expected. The H-100 is less prone to sibilance than several of my VSonic earphones and lacks the graininess of the MEElec A161P, for example. The bright treble gives the sound an added clarity – the same principle used by the JVC FX40 and PureSound ClarityOne. In fact, despite its bass boost and recessed mids, the H-100 has very intelligible vocals and works well at low volumes. The presentation of the H-100 is wide and spacious, as tends to be the case with earphones that share these types of v-shaped signatures. The soundstage is good overall and the sound is very airy, making earphones such as the VSonic VC1000 and MEElec A161P sound quite intimate in comparison. Soundstage depth isn’t great, however, and the earphone doesn’t produce properly centered vocals the way a less mid-recessed set, such as the A161P, can. HiFiMan’s latest mid-range offering combines a balanced sound with a compact, user-friendly form factor and sub-$100 price tag. Next to the v-shaped sound signature of the H-100, the RE-400 sounds very well-balanced, perhaps even a little mid-centric. The H-100, on the other hand, lacks midrange weight and sounds a little “hollow” in comparison. It has significantly better deep bass presence but also more treble than the HiFiMan. The added treble results in a brighter overall tone compared to the more neutral and natural RE-400, but also causes the H-100 to appear clearer, akin to using a treble boost equalizer setting. Naturally, the brighter H-100 is more revealing of sibilance and overall less forgiving than the smoother RE-400. The H-100 does have an advantage in soundstage width, appearing a lot more spacious and less intimate than the HiFiMan set. All in all, these two earphones sound vastly different and make each other sound bad in comparison – after listening to the RE-400, the H-100 sounds overly bright and hollow in the midrange. Switching back to the RE-400 after using the H-100 makes the HiFiMan sound overly intimate and lacking in bass depth. VSonic’s dynamic-driver GR07, like the HiFiMan RE-400, follows a rather balanced sound signature but, due to its greater bass depth and treble sparkle, does not sound like a complete antithesis to the T-Peos the way the RE-400 does. Admittedly, the GR07 is still quite a bit flatter than the H-100, offering up a sound that is less bright and more coherent, but it doesn’t sound downright mid-centric in comparison. The tone of the GR07 is warmer than that of the T-Peos due to its greater emphasis on mid-bass and less subbass quantity. It is also thicker in the midrange and again makes the T-Peos sound a bit hollow with its thinner, more withdrawn mids. The bright treble of the H-100 gives vocals good clarity and intelligibility but ultimately the sound is thin and not entirely natural. Interestingly, though the H-100 is brighter, the GR07 is still more prone to sibilance. Overall, I found the pricier GR07 to be better than the T-Peos for its more accurate and natural sound, though when listening to EDM music the H-100 makes a very strong case for itself and may even be preferable to the VSonics. Value (8.5/10) – The T-Peos H-100 is a BA+dynamic hybrid earphone with a rather unique sound signature. V-shaped, with an emphasis on subbass and treble, the H-100 sounds bright, but with a sizable deep bass kick. It reminds me of a more refined JVC HA-FX40, and like the FX40 provides a uniquely lively experience with EDM. With very nice packaging and an all-around competent design, the H-100 is a standout in value as well, as long as its signature meshes well with the listener. How do you compare h 100 with fad heaven II? The Heaven II is much flatter/more balanced. It’s more like an Etymotic reference monitor. The H-100 is very v-shaped in comparison.